The definitive proof of what I say is up above. Would you believe four game officials ruled that as not a goal? Watch the video, particularly at the 2:25 point where Atlanta’s Goalie plucks the puck out of the net with the rules officials around. Were there four blind mice wearing stripes last night in Sunrise? The NHL has a review system in place when a goal or non-goal was questionable. It was never used last night. Why? This Panther blogger wonders openly if the NHL has two sets of rules and Florida is on being judged by the bum set. There is a mounting pile of evidence from this season’s games that says just that. The kick in Edmonton to open the season, the tackling of Panther Goalie Scott Clemmensen by a Toronto player and the NHL rules official clearly said the referees that night blew it, and then this. Florida lost 15 games this year to other teams, and had three more games taken from them by scandalous rulings on ice. What the hell is going to be the NHL’s excuse this time? Were they with or without syrup? A frustrated Toronto Maple Leafs fan who threw waffles on the ice at the Air Canada Centre will have to admire his team from afar. Joseph Robb was charged with criminal mischief and barred from the arena for throwing waffles on the ice at a Maple Leafs game to protest the team’s performance this season. The 12-17-4 Leafs were 28th out of the NHL’s 30 teams entering Wednesday’s games. The waffles in question were uncooked Eggos, but we don’t know what flavor. No syrup was found on the offending waffles. Robb has been banned from other sporting events because of his unruly behavior. He’s an out of control jerk, IMHO. Normal fans don’t throw uncooked food on the ice and disrupt games. The Atlanta Thrashers have agreed to trade goalie Kari Lehtonen to the Stars, Dallas general manager Joe Nieuwendyk said on Tuesday. The Thrashers will get prospect Ivan Vishnevskiy as well as a fourth-round draft pick in exchange. The 21-year-old Russian defenseman was the Stars’ first-round pick, 27th overall, in the 2006 NHL entry draft. The deal was first reported by ESPN.com’s Pierre LeBrun. Lehtonen will take a physical for the Stars on Wednesday. Lehtonen is earning $3 million this season and is a restricted free agent July 1. 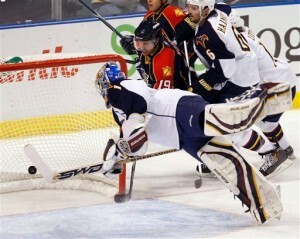 The Thrashers deemed him expendable with the tandem of youngster Ondrej Pavelec, 22, and veteran Johan Hedberg, 36. The acquisition of Lehtonen looks risky to me. That due to the fact he has had back surgery twice in the last year. Dallas will likely need a new starting goaltender for the 2010-11 NHL season. Veteran Goalie Marty Turco is a unrestricted free agent at the end of this season. The New Jersey Devils have won the Ilya Kovalchuk sweepstakes, acquiring the superstar winger from the Atlanta Thrashers on Thursday night. The Devils have struggled of late, especially scoring goals. Veteran Devils GM Lou Lamoriello didn’t hesitate, swooping in and acquiring the biggest rental player available on this year’s trade market. In exchange, the Thrashers get rookie forward Niclas Bergfors, defenseman Johnny Oduya, prospect Patrice Cormier and a first-round pick in this year’s draft. Oduya has two more years on his deal after this season at a $3.5 million salary-cap hit. Bergfors will be a restricted free agent July 1. Cormier was suspended for the rest of the season in the Quebec Major Junior Hockey League for an elbowing incident but he’s a highly regarded prospect. In addition to Kovalchuk, New Jersey also gets defenseman Anssi Salmela, who was originally a Devil and sent to Atlanta at the trade deadline last year. Kovalchuck is still a free agent at the end of this season. The Devils may have acquired a rental only. If Kovalchuk doesn’t get New Jersey to the Stanley Cup finals at least before fleeing for greener pastures, this deal will rate as a total bust. Here is another concern with the dea- How well will Kovalchuk, 31 goals and 27 assists in 49 games this season, play under the system, sometimes referred to as ‘neutral zone trap’ used by NJ Devils Coach Jacques Lemaire? It is very defensive oriented. I think Kovalchuk will adapt but may slow scoring goals and assists till the Olympic break. Ilya Kovalchuk couldn’t break Antero Niittymaki’s “curse” on the Atlanta Thrashers. Instead, the Thrashers captain broke his stick in frustration. Niittymaki stopped 26 shots for his 16th straight win over Atlanta and the Tampa Bay Lightning beat the Thrashers 2-1 on Tuesday night for a rare road victory. Stephane Veilleux and Martin St. Louis scored first-period goals and Niittymaki protected the lead, giving up only a second-period goal to Todd White. 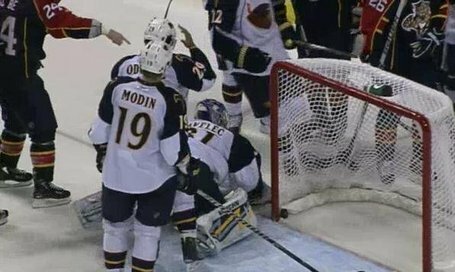 Kovalchuk, the Thrashers’ star who is the subject of trade rumors, broke his stick against the net at the end of the game. He has no goals in the three games against Niittymaki this season. Niittymaki improved to 13-9-5 overall this season. He is 5-1-1 in his last seven games. The Lightning improved to 4-1 against the Thrashers this season with their fourth straight win in the series, including three victories with Niittymaki in the net. Niittymaki, in his first season with the Lightning after five with Philadelphia, improved to 11-0 at Philips Arena. Tampa has split its goaltending duties between Nittymaki and Mike Smith, but if I were Rick Tocchet I’d hand the job to Nittymaki. His stats(2.47 GAA and .918 save pct) is far better than Smith’s (2.97 and .904). As for Nittymaki’s mastery over the Thrashers, some players get so hut against a particular team it starts getting into people’s heads. I know it did when I played high school sports and competitive chess. Some teams or players always appeared unbeatable. Tampa(23-21-11 57 pts) and Atlanta(24-23-8-56) are both in the midst of the 8-team Eastern Conference playoff shuffle. One point separates the teams but the Lightning stand in 8th place and Atlanta 11th. I expect alot more movement between now and April. The Kovalchuk saga in Atlanta is playing out similarly to what went on between the Florida Panthers and Jay Bouwmeester last season. Will Atlanta trade their best player or do what Florida did, keep him for a playoff push? I think Kovalchuk will end the 2009-10 season in Atlanta but will be playing somewhere else in the NHL next season. Gregory Campbell scored midway through the second period and Tomas Vokoun made 27 saves in the Florida Panthers’ 1-0 victory over the Atlanta Thrashers on Monday night. Vokoun earned his fifth shutout of the season and won for the fifth time in his last seven home starts. Vokoun has made 101 saves in the last three games, all Panthers victories. Florida is on its fourth three-game winning streak of the season. Whenever I start getting optimistic about the Panthers(they have more wins than losses now on the season), I remind myself that they haven’t had a winning streak longer than 3 games since the 2006-07 season. They can never get real hot, which is one reasons the team can’t get to the playoffs. Vokoun was incredible tonight. He made a diving 2-pad safe early in the game. Later, he had to deflect away shot after Thrasher shot. Atlanta pulled their goalie and then when Florida committed a penalty, the team had a 6-4 advantage for the last 90 seconds of play. Gregory Campbell in addition to scoring the only goal(with a helpful screen from Rusty Olesz) won a key faceoff in the last 20 seconds, and just a little while later, cleared the puck out of the Florida zone as the last few seconds ticked off the clock. Those plays got Florida the win tonight and make Campbell Co-MVP for a night but he still has played like crap this season for the most part and is a drain on the team. Next up for Florida- A road trip to New Jersey and the NY Islanders. Personal note- I just bought my first ever ticket to a Panther game. On Monday February 1st, I will see them play Anaheim. That’s one of 3 Florida games not on television this year. I am really addicted to Panther hockey, eh? Due to the Winter Olympics, the NHL season is being being played at a more accelerated rate than normal. For instance, prior to Christmas week the Florida Panthers had four games in a week, five straight weeks in a row. Bold denotes all teams who would make the playoffs as of this minute. The above standings are as of 6 p.m. on Saturday January 2nd. That’s hardly rocket science based on the above. I will be greatly surprised if Florida, NY Islanders, or Toronto are playing in the post season. The Panthers haven’t made the playoffs in 10 years and this will be no exception. How is a team that hasn’t won more than 3 games in a row since March 2008 supposed to get the momentum up for a playoff run? Honestly I think the teams who are currently 1-8 will all make the playoffs. There will be reshuffling but I think the 7 other teams each have enough liabililites that it will keep them out of the postseason. Michael Frolik scored with 1:21 left to lift the Florida Panthers to a 4-3 victory over the Atlanta Thrashers on Wednesday night. Stephen Weiss, Radek Dvorak and Bryan McCabe also scored for Florida, and Tomas Vokoun stopped 19 shots. Ilya Kovalchuk, Nik Antropov and Vyacheslav Kozlov scored for Atlanta, which overcame a three-goal deficit to tie the game in the third. Johan Hedberg made 25 saves for Atlanta. On the winning goal, Frolik poked in a rebound, putting the puck high in the net. Tonight’s win was a reversal of the game that saw Goalie Tomas Vokoun get hurt. In that game Atlanta scored late to win. Panther announcer Billy Lindsay termed today’s game ‘revenge’. I’d certainly call the game a Alka Seltzer affair because of Florida blowing a 3-0 lead. At this moment the Panthers are some how tied for the 8th spot in the Eastern Conference. I’m still not a believer the Panthers can make the playoffs in 2010. This is certainly the weirdest twist for the Panthers during the 2009-10 NHL season. Florida is playing the Atlanta Thrashers in Atlanta. The game is early on, and Ilya Kovalchuk just scored a goal to put Atlanta ahead 2-1. After the play was over, Florida Panther defensemen Keith Ballard swung his stick at the goal net in frustration. In the process he hit Tomas Vokoun in the head. Vokoun has been down on the ice for approximately five minutes now. Vokoun is being taken off the ice on a stretcher now. Scott Clemmensen is in goal now, and I expect Alexander Salak to be down from Rochester(Florida’s top minor league team) in time for Wednesday’s game. I want Florida to do well, but right now my greater concern is for the health of Vokoun. The Panthers are 10-11-4 for the year, and the season has seen some wild swings. I just never expected one to be a serious but dumb injury to our #1 Goalie because of the actions of one of his teammates. Update- AP reports Vokoun has a ear laceration and is alert. Here’s the video of what happened. Atlanta Thrashers goaltender Kari Lehtonen is expected to miss six to eight weeks after having a second surgery on his back. Lehtonen has not played this season after having surgery July 20 to repair a herniated disc. The team said Wednesday that Lehtonen had another surgery Friday in Rochester, N.Y., to remove edges of bone that were applying pressure to nerve roots in his back at two locations. Ondrej Pavelec has been a more than decent job in goal. In addition the Thrashers have been without the services of star winger Ilya Kovalchuk for most of this season. Atlanta isn’t slumping with these injuries, they are 6-4-1 at present. Lehtonen’s back problems may put his career at risk. The 2nd overall pick of the 2002 NHL entry draft hasn’t played to the level Atlanta hoped for when they drafted Lehtonen so high.